www.UfoQuest4Truth.com - album 52: End Of Pisces - End of Times - End of Days - End of Nations - EndGame/Solomons Temple in Kashmir. Scroll down and to the right to see all texts and pictures. Welcome in our Free Virtual UFO Library! 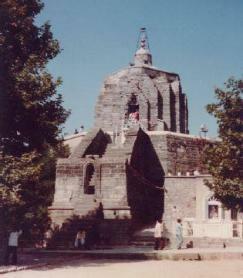 Solomons Temple in Kashmir. Scroll down and to the right to see all texts and pictures. Welcome in our Free Virtual UFO Library! During the latter part of the 1870s, Notovitch decided to embark on an ?extended journey through the Orient.? "We also respect the one whom you recognize as Son of the one God. The spirit of Buddha was indeed incarnate in the sacred person of Issa [Jesus], who without aid of fire or sword, spread knowledge of our great and true religion throughout the world. Issa is a great prophet, one of the first after twenty-two Buddhas. His name and acts are recorded in our writings." Notovitch then left the area, but while riding his horse near Hemis Monastery, Notovitch suffered a terrible fall from his horse and broke his right leg, and he was forced to remain under the care of the Buddhist monks at Hemis until his leg healed. During this time he had the scrolls read to him and his translators translated it for him. Notovitch took notes, and this formed the core content for his book. Read extracts here. Kersten states that the name ?Isa?, or ?Issa?, derives from the Syrian, Yeshu (Jesus), ?being altered to conform to Musa (=Moses).? It is very interesting that Jesus is referred to as ?Issa? in Buddhist documents, as ?Isa? in the scripture of Islam, the Quran, and as ?Isa? in the Hindu scripture, the Bhavishya Mahapurana. That the religious documents of these three religions mention Jesus as ?Isa? suggests that this was actually a name by which he was known in the East. Buddhism and Hinduism predate Islam. "When I visited the Lamasery [Monastery] at Hemis, and together with the Lama Ishe Tundup and Mr. Stobden interviewed the 'Manager' (The young head Lama being in Tibet studying), the other Lamas who also were present belonging to the Monastery immediately said that their older monks did remember an Englishmen being injured and brought to their Monastery and that some MSS [manuscripts] were shown to him." This account was given in the 'PS' section of a diary entry for the 'Moravian Mission' who had in the rest of the entry tried to discredit and write of the St Issa scroll. This translated diary entry is now well known and documented in several books on Jesus in India. In addition Dr Fida Hassnain during his own enquiries in to the scrolls spoke to people at the monastry who talked about both Notovitch's visit and the scrolls. So was he really there? The anwers appears to be a resounding Yes. The photo of the pages of the diary was made in 1958 by the journalist Mrs. Amlabai Ketkar. Mrs. Ketkar brought the photograph from the Moravian Mission house in Leh/Ladakh, got it translated into English, and furnished copies, along with her comments, to Mr. Aziz Kashmiri. Henrietta Merrick 1921 Visited and later wrote in her book, In the World's Attic "In Leh is the legend of Jesus who is called Issa, and the Monastery at Himis holds precious documents fifteen hundred years old which tell of the days that he passed in Leh where he was joyously received and where he preached." Edward Noack & Wife 1970s A monk there told him: "There are manuscripts in our library that describe the journey of Jesus to the East."